No one is sure who was the first to call him Maniac. He just appeared in town one day. After Jeffrey Magee’s parents died in a trolly crash, he started running and didn’t stop until he arrived in Two Mills. Along his path to finding a real home, Jeffrey meets Amanda, a book-loving girl his age, an elderly former baseball star named Grayson, the wild McNab family, and a boy nicknamed Mars Bar. 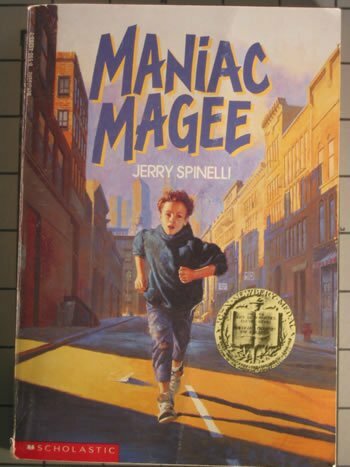 In a time when blacks and whites were separate, Maniac Magee is able see past the gap between the two sides of town and bring happiness to people he meets along the way. This is a heartwarming story about a boy desperate to find his place in the world. It takes place during a time when segregation was still in existence, yet Jeffrey remains colorblind and innocent to the racial tension around him. I would recommend this to upper elementary students, especially boys, for Jeffrey’s adventurous spirit and athletic abilities. This sequel to Matched tells Cassia’s and Ky’s stories in alternating chapters. Both are doing hard labor, far away from the quiet suburb where they met. As Cassia struggles to get back to the boy she loves, Ky struggles to survive. With a brief cameo from Xander, Cassia’s Match, we learn only that he is still willing to fight for her and that he has a secret. 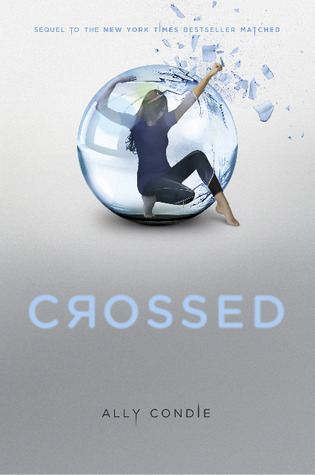 As often happens with the second book in a series, Crossed was a little slow compared to Matched. It was more about the journey than any real action until the ending, which sets the scene for the third book. Even though I didn’t enjoy the second book as much as the first, I was still invested in the characters and rushed to the library to get the third book in the series… that doesn’t come out until November. A baby wanders out the open front door, away from his family that has just been murdered in their home. He toddles into an old, abandoned graveyard, away from the killer. A dark, shadowy figure keeps the killer away; the wispy figures the graveyard vote to keep the baby there, safe from harm. And so Nobody Owens grows up in the graveyard and spent his days learning about history from those who were there and ghostly skills like Fading and Dreamwalking. As he gets older, he learns lessons about the dangers of the outside, specifically the killer who continues to search for the boy who got away. An interesting tale of a boy raised by ghosts in a graveyard. There are a few spooky parts, but overall the story is endearing; the ghosts love and protect Bod as their own child. Highly recommended for upper elementary or middle school. Good book for boys. Emmy is always trying to be good. Not that it does her any good. Even though she has straight A’s on her report card and does everything her nanny, Miss Barmy, says, no matter how bizarre, her parents are always away on trips and her classmates act like she doesn’t even exist. When the Rat, the talking class pet that only she can hear, tells her she should try being bad to get some attention, she thinks about it. Emmy skips ballet and stumbles upon an antique store called The Antique Rat. Inside, hidden in the back room, she makes a surprising discovery. When this draws the attention of the sinister Professor Vole and the mean class Rat shows up at her bedroom window, Emmy begins to realize the strange things going on in her life might be connected. Emmy and the Incredible Shrinking Rat is an awesome, unique story filled with mystery and fantasy. Emmy is clever and brave, the Rat is arrogant and witty, and Miss Barmy is just plain evil. Highly recommended for girls and boys in 3rd grade and up. This series was brought to my attention after visiting one of my lawyer friends and hearing her and her law clerk gush about how great it was. But I respect her opinion and promptly checked the first book, The Hunger Games, out from the library to read what all the hubbub-bubbery was about. My first thought was what kind of Twilight-esque formulaic female teen fiction thing had I gotten myself into? Well I wasn’t disappointed. For those who enjoy campy love-triangle goo tailor-made for young female teens with identity issues, this series is rife. I say that up front to dispel the idea that this is a new and innovative work of fiction. Now, having said that, I will go on to say that I guiltily enjoyed all three books despite the goo. My reasons for enjoying them may, however, be reversely proportional to why the female teens may not enjoy the series. So with all that backdrop, enter protagonist Katniss Everdeen who, you guessed it, comes from a broken family, is fit and attractive though unaware of her sexuality, has to care for her little sister, may be in love with her hunting friend Gale, but is then torn between her feelings of Gale and her soon to be Hunger Game partner Peeta. And, yes, this wouldn’t be much of a story if Katniss were to escape the lottery and not go to the Hunger Games. So the story goes and she is forced to kill or die in the arena of 23 other teenagers. I don’t think I away too much by saying Katniss doesn’t die (there are two more books after all). The first book deals with her fight for survival in the games. The second ends up being more similar than I expected in that Katniss goes to the games again the following year (it makes sense when you read it). And finally, the last book deals with her role in overthrowing the capitol as the districts’ symbolic leader. Such a story would not be very satisfying if the good and downtrodden didn’t take out the evil and excessive. Of course that is easier said than done and I would bereft of reviewer tact if I were to reveal the details of what actually happens. Let’s just say lots of people die. Lots of kids get blowed up. I didn’t want to like this series, but I couldn’t help myself. The books are well written and the storyline really draws you in. The premise may not be the typical young lit other books have to offer, but that works to make this series stand above the others. So whether girl or boy, teen or thirty, lawyer or lay, this series is a fun read, nothing heavy, and definitely worth checking out. Though, with the upcoming movie, I’m sure I’ll have to hate it soon enough.